Set your slow cooker the night before and wake up in the morning to a delicious crockpot breakfast casserole. With eggs, sausage, mushrooms, bell peppers and cheese! I’ve said it before and I’ll say it again: I’m not a morning person. BUT. I still like delicious breakfast food. My solution? Get breakfast started the night before! I did it with this Overnight Breakfast Casserole with Bacon & Sweet Potatoes, and this Overnight French Toast Bake, and I’m doing it again with this overnight crockpot breakfast casserole. cook you sausage. If you can get pre-crumbled sausage (no casings) even better! mix your eggs and milk with all purpose or almond flour plus baking powder and seasonings. You can use an immersion blender to get it smooth! The flour helps prevent it from getting too wet in the slow cooker. toss it all together with some shredded cheese and cook away! Low 6 hours is the best time/temp, HOWEVER you can also leave this on warm for another 2 hours. The edges will get brown but this crock pot breakfast casserole still tastes really good! 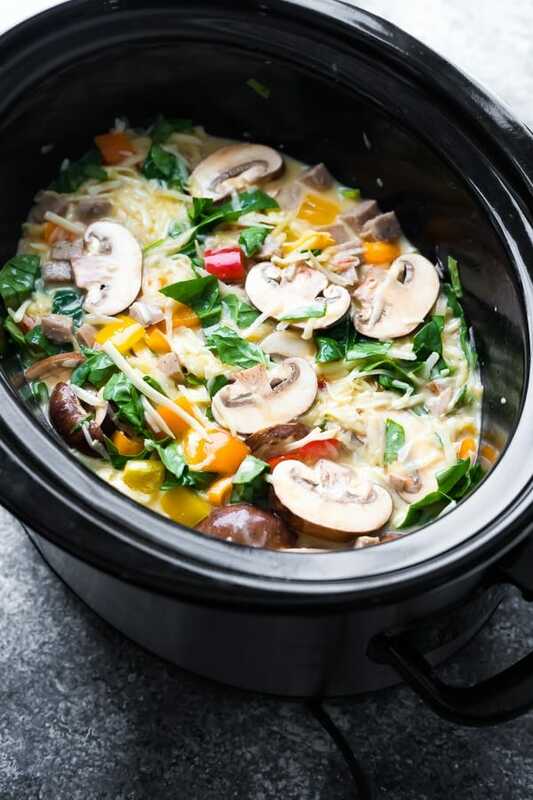 Can I cook this crock pot breakfast casserole for a shorter time? You can probably cook this on high for a few hours, but I’ve only tested on low. Can I swap out the sausage? Mushrooms? Other veggies? Yes, yes and yes! 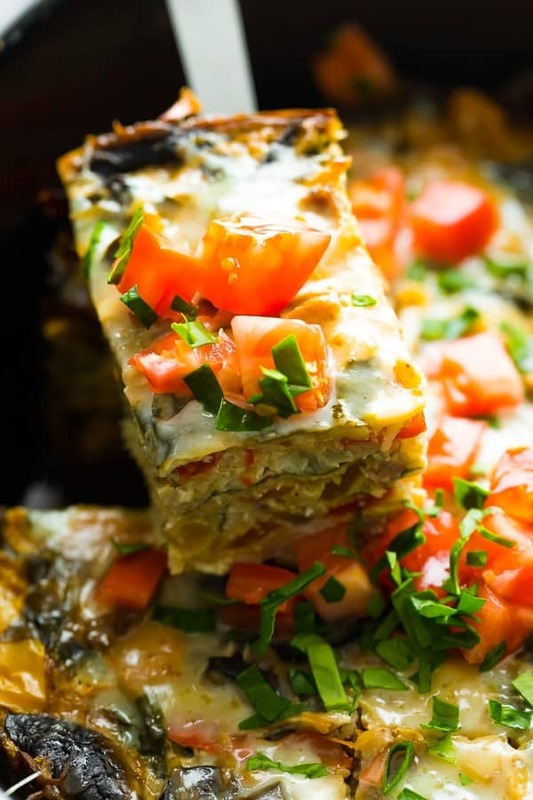 This is a very versatile crock pot breakfast casserole. I’d suggest swapping the sausage for some cooked and crumbled bacon. You can swap the mushrooms for almost any other vegetable, just make sure that you cook and drain the liquid first. 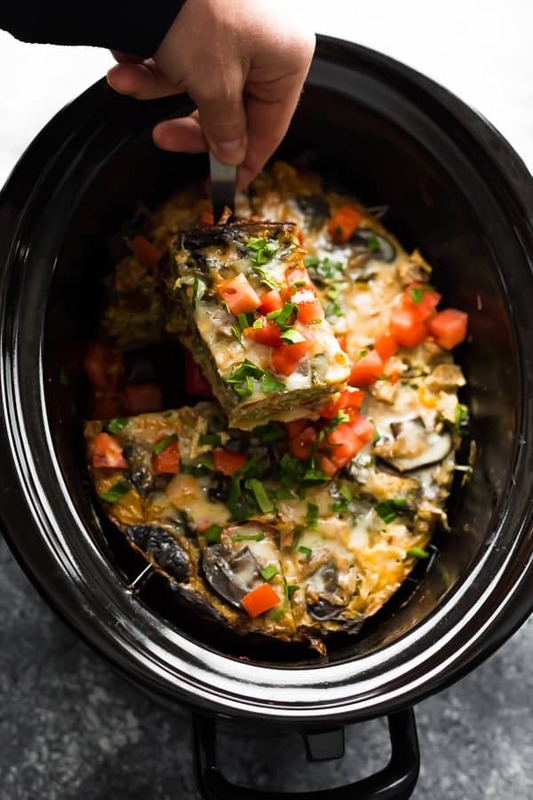 Other vegetables that would work in this crock pot breakfast casserole? Onions, kale, shredded zucchini (no need to cook first, just drain the extra liquid), broccoli, cauliflower rice, sun dried tomatoes, etc. 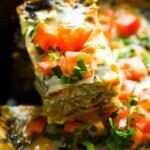 Can I add hash browns or shredded potatoes to this overnight crock pot breakfast casserole? Yes, you sure can. I added shredded potatoes to one batch (didn’t pre-cook them), but found that they just kind of blended into the eggs…you couldn’t taste them, and they didn’t add anything to the texture. If I’m adding potatoes to my breakfast I darn well want to taste them! LOL. 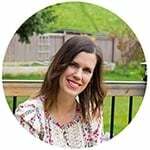 Can this overnight slow cooker breakfast casserole be re-heated? Absolutely! You can even cook it the day before, then re-heat for a brunch. I’d heat on low for 2 hours, and add some freshly grated cheese at the end. You can also portion these out and re-heat in the microwave for easy meal prep breakfasts. *Important* do not re-heat leftovers more than once (this is what is advised by food safety experts). 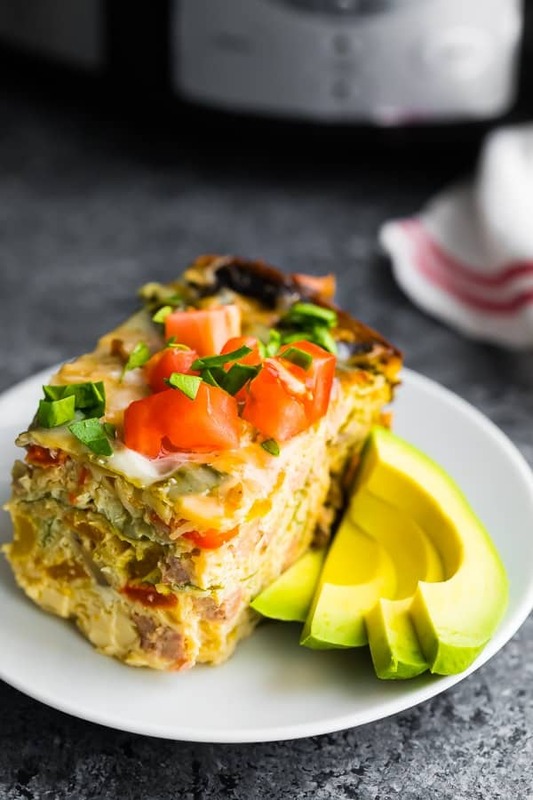 What should I serve with this slow cooker breakfast casserole? We served ours with fresh tomatoes and avocado slices. You could add some salsa, fresh herbs, or serve with fresh fruit on the side. Looking for more big batch breakfast recipes? Try this Peach Baked Oatmeal Recipe, these Ultimate Breakfast Burritos and these Instant Pot Steel Cut Oats, which each can make 8 servings! Spray slow cooker with spray oil. Cook sausage in a pan. Drain if there’s too much grease. Add the mushrooms & peppers, cook until soft. Place in the slow cooker. Beat the eggs and milk. Whisk in the flour (or give it a good blend with an immersion blender), baking powder, salt, onion powder, garlic powder. Pour egg mixture over the sausage mixture in the slow cooker. Cook on low for 6 hours. This casserole can sit for a few hours on warm but is best after 6 hours. Nutritional info is calculated with almond flour. 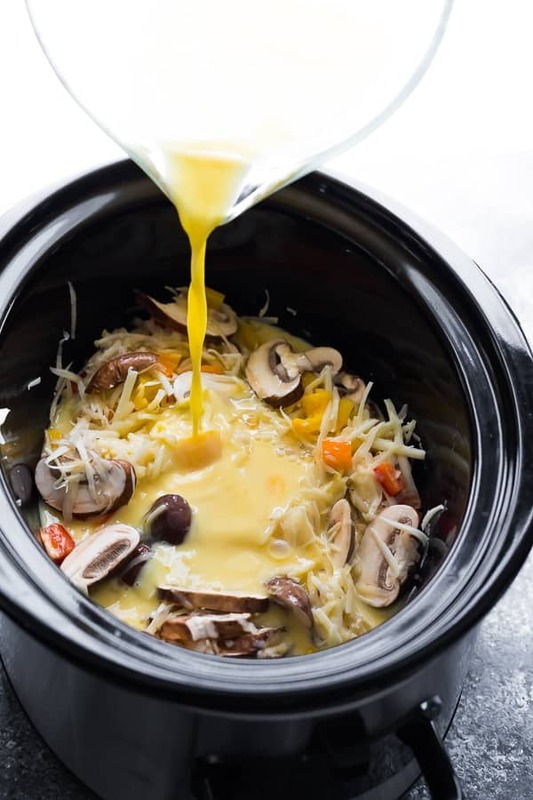 Have you ever tried doubling the recipe in a large crockpot for a bigger batch? Or doubling/tripling it & cooking it in a roaster? I’m looking to make this for a group of 20 and wondering if it would be better to do several crockpots or if I would be able to make bigger batches in a roaster or 2 crockpots. Thanks! Hi Allie, I haven’t tried cooking it in any crockpot other than my 6 quart, and unfortunately I don’t have any experience cooking with a roaster so I really can’t say. If you try it I’d love to hear how it goes for you! Eggs and potatoes are a staple at our house!! And I love making breakfast in the crockpot and for brinner!! That’s a great idea, Sasha! I might have to make some brinner, too!